This Amida Triad is the main devotional object at Zenkōji Temple 善光寺 in Nagano Prefecture. It reportedly was made in India, then traveled to China, and was brought to Japan by Hata no Kosedayuu 秦巨勢大夫 in +552. The central Amida Nyorai statue is flanked by Kannon Bosatsu (who personifies compassion) and Seishi Bosatsu (who personifies wisdom). Photo From This Web Site. Donald F. McCallum, Professor of Art History, UCLA, 405 Hilgard Avenue, 100 Dodd Hall, Los Angeles CA 90025-1417. 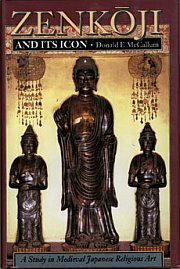 This photo is the dust jacket to Zenkōji and Its Icon: A Study in Medieval Japanese Religious Art by Donald F. McCallum.